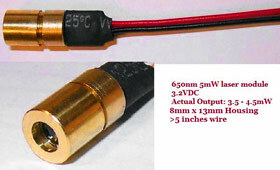 These volume discounts are for the 8x13mm, 5mW/650nm diodes with focusable lenses, used by OverMachoGrande and others in their do-it yourself projects. These diodes are normally priced at $4 each. Once again, if you have any questions, please call AiXiZ at the above numbers or send an email to aixiz@aixiz.com. Visit the websites at www.AiXiZ.com and www.mfgcn.com!